The A-26, designed as a low-level attack bomber was equipped with two General Electric remotely controlled gun turrets. The upper turret was mounted on the top of the fuselage above the bomb bay. The lower turret, used exclusively for ground strafing, was mounted on the underside of the aircraft. In addition to the 6 to 8 .50 calibre fixed guns in the nose, there were 6 .50 calibre guns in the wings and rocket rails. The aircraft carried a crew of three, Pilot and Navigator up front side by side and the gunner in a compartment in the rear. The remote control turrets were operated through a periscope type gun sight. The Gunner occupied a bicycle type seat. A heavy duty four inch lap belt was all that held him in position. As the Gunner sat towards the rear of the aircraft, he was subject to twice the G force of the Pilot and Navigator. Unlike most gunnery systems that were designed as defensive weapons, the Invader systems were designed for offensive action. Special talent was required to operate the gun switches when the aircraft was in a steep turns at high speeds and low altitudes. With the revolutionary Central Fire Control System (CFCS), the A-26 had two remote controlled turrets, each armed with two .50 cal M2/AN machine guns. 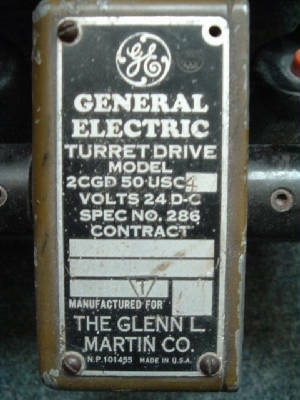 A single gunner were able to control these turrets with the use of a General Electric-made analog computer. The .50 caliber machine guns of the A-26 had a maximum effective range of 1,000 yards (910 m), double the range of the manually aimed machine guns of the B-17 Flying Fortress. 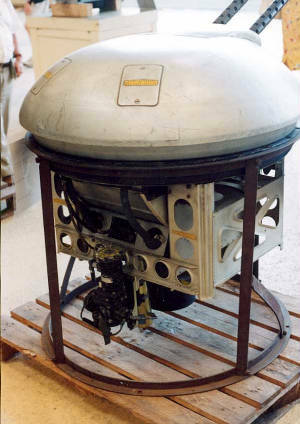 Note: In aircraft destined for service in the Pacific (-51-DL, -56-DL, -61-DL, and -66-DL), the remotely-controlled ventral turret was replaced by a 125-US gallon auxiliary tank for extra range. Directly aft of the bomb bay was the gunner's compartment. 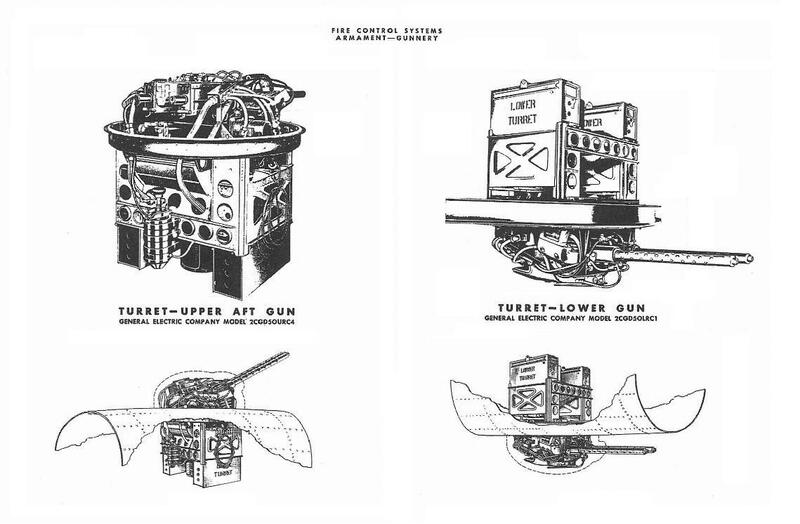 The gunner controlled the remotely-operated upper turret, located in the upper aft bomb bay section, and the remotely-operated lower turret, located just aft of the gunner. Access to the gunner's compartment was through a sliding door located on the aft bulkhead of the bomb bay. If the bomb bay was loaded with bombs larger than 300 lb, the only access to the compartment was through the emergency exit hatch located on the Plexiglas enclosure above the gunner's compartment. On some aircraft a Plexiglas escape hatch was also provided on the right side of the compartment; this hatch could be jettisoned from the inside hy turning a handle and pushing the hatch out. 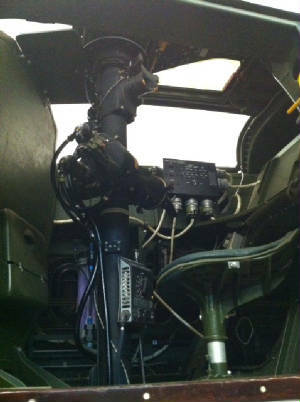 A removable camera port was also installed on each side of the gunner's compartment. The gunner's position was at a sighting station built around a periscope-type sight installed vertically in the compartment. His seat was mounted on a circular track around the sighting unit, with a vertical piece of armour plate attached to the assemhly for protection. The seat could be rotated in either direction by the movement of the gunner's feet against the compartment floor. As equipped, the seat rotated independently of the sighting unit itself. On later aircraft, however, a power motor was installed to move the gunner's seat and it rotated in conjunction with the sighting unit. Both the A-26B and the A 26C were equipped with two General Electric remotely-controlled turrets, each equipped with two .50 calibre M-2 machine guns and a General Electric sighting station mounted in the gunner's compartment. 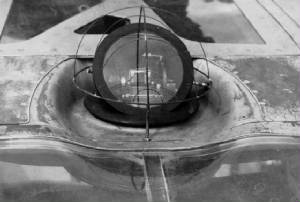 The General Electric gun sight was equipped with upper and lower periscope heads that extended above and below the fuselage. The gunner controlled and fired both turrets electrically using the gun sighting station equipped with a non compensating gun sight. The gunner rotated the sighting station to set gun sight azimuth; he rotated gun sight handles around the horizontal axis to set gun sight elevation. The sight itself maintained a 50-degree field of vision through both the upper and the lower periscope. Some aircraft had 70-degree field of vision sights. The site automatically switched from the upper periscope to the lower and vice versa, based upon the gunner's elevation setting, wi th a 10-degree overlap between the two periscopes. The guns in both turrets had 360-degree travel in azimuth. Those in the upper turret elevated from 0 to 90 degrees up; the guns in the lower turret depressed from 5 to 89 degrees down. The overlap permitted a 5- degree crossfire between the two turrets. The maximum rotational speed in azimuth was 45 degrees/sec and 30 degrees/sec in elevation for both turrets. 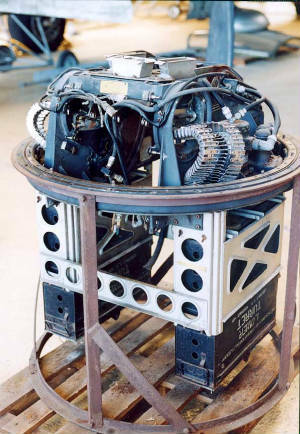 The gunner could rotate the sighting station in any direction for the purpose of scanning. 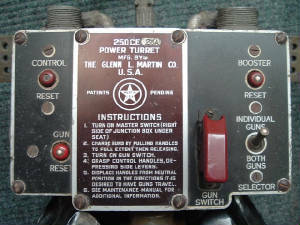 When the gun sighting station was engaged with a turret by turning the turret power 'on', the guns in the turret moved in correspondence with the sighting station. While engaged, every motion of the sighting station was mirrored by the turret(s). prevented the guns from firing into areas of the wing, empennage and propeller arcs. Each turret could hold a maximum of 1,000 rounds. compartment and the pilot could then select the upper turret guns for use in conjunction with or separately from the other forward firing guns. When the pilot had control of the upper turret, the gunner still retained control of the lower one, using his sighting equipment. On A-26s fitted with the bulging canopy the contour follower protected the canopy from the guns, thus they could no longer be fired from the fully depressed position while locked forward. 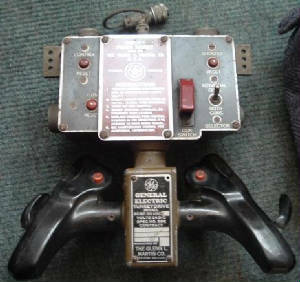 The pilot was also provided with a device in the cockpit called the 'tell talc indicator' that depicted the position of the guns in both turrets. With this information, the pilot could manoeuvre the aircraft to provide the gunner with the best defensive use of the guns and to keep the firing direction clear of areas protected by the firing interrupters. The above two shots were kindly donated by Fred Besnard. The head of the periscope that the gunner used to view when firing his remotely controlled guns. reasons the lower turret was removed from the A-26. A. For the altitudes and types of missions being flown (mostly at low altitude), the turret was pretty much useless. B. The A/B 26 had a severe CG problems and the removal of the turret helped address part of that problem ( There were also restrictions on what weight bombs were loaded on what stations ) This was however cancelled out when the lower turret was replaced with an extra fuel tank. Note: On air tanker duties, this was addressed prior to the 1978 and 1970 fire season. The Forestry Service sent a message to all operators of the A-26 type aircraft that the slurry tank had to be modified to move the Center of Gravity of the load forward (we filled the aft 25% of the tank w/blocks to move the load forward). Apparently the Forestry Service had run Weight & Balance computations and determined that in a fully loaded and gear up condition the A-26 CG was well aft of the CG envelope and with the tank empty and the gear down, the CG was was as far forward as it could get in the CG envelope. The Central Fire Control System installation manuals below, were supplied via David Lane who owns and operates 44-34313 ( N119DR ) Thanks David for your help in providing these documents.